You know, a lot of people think that Darren Hayes is my main man when it comes to favourite male singers. But you know what, he's not. I know - Shock! Horror! Blasphemy! Actually, when it comes to favourite male singers of all time - my favourite has to be the man above - and his name is Tommy Page. It seems almost appropriate that I revisit Tommy Page today. He was a huge American and Asian wonder boy back in the early 90's and has even collaborated with Tiffany and toured with New Kids On The Block and that my friends was a huge part of my "electric youth" (did you get that?). 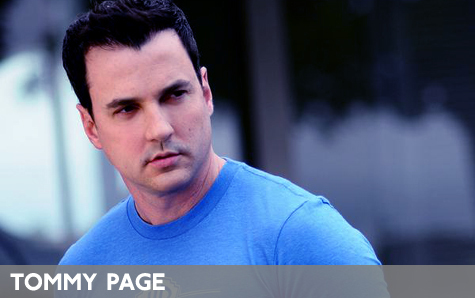 Tommy Page today is a man behind the scenes and is VP of A&R at Warner Brothers records and is helping to shape the careers of High School Musical's Ashley Tisdale, new boyband V Factory and sassy girl group Tiffany Affair. Even though he's stepped out of the limelight and gone behind the scenes, he will forever be a huge part of my life. He's recently launched his MySpace page with a plethora of new photos and some free downloads and I have to say it - he's totally still gets me - years later. The voice, the looks, and above all - he's still a nice guy. I have managed to meet Tommy a few times in this life and he's always been uber lovely. There are welcomed rumors going around that he might be doing something new musically and that leaves me very very very (did I say very?) excited. Check out the free downloads on his MySpace page of classic tracks "Like Air", "Places In My Heart" and his brilliant cover of "Missing You". Tommy also holds the esteemed privilege of writing and performing my favourite song of all time called "A Shoulder To Cry On" which if you don't own, you must go find it and download it now. His last official album "Ten Til Midnight" still remains one of my favourite albums of all time. Here's a little vid-e-o from Tommy Page in his prime for "Places In My Heart". Sigh, you got one in mine Tommy. And Tommy - if you're reading this...I am DYING to interview you. Let's make beautiful words together! For everything Tommy Page and to discover what the hell I am going on about for you younger readers, visit his official website. I remember this guy. Ah, the good ole days at home in Canada. He was definitely tops in my list. Thanks for giving me the heads up on what he's been up to. I simply adore him. If you or anyone else do get to talk to him, please let him know that many of us out there are desparately looking for his Ten Til Midnight album and waiting for him to pour his heart out again through his beautiful music and voice. He is certainly one underrated talent who was in caught in the wrong timing. But with the reunion of the New Kids on the Block, many fans are also keeping their fingers crossed for Tommy to write and sing again. Is it true that he is not straight? This morning my old pal Tommy was doing his commute from New Jersey to Manhattan and he decided to while away the time by calling me (at 7AM my time). As always, it was wonderful to hear from him. I got to know him many years ago as a singer/songwriter, when my boss signed him to our record label in the hope of seducing him. He failed in that attempt but was far happier when Tommy had a #1 song and a real recording career. "Boy band" careers, however, aren't actual careers and Tommy had the good sense to go to college, invest wisely and, eventually, marry his college sweetheart, the captain of the football team. Years later I hired him as an assistant in the promotion department and he worked his way up the ladder to become a hugely successful promotion vice president and is now an A&R man, helping young artists make their own musical dreams come true. He and his husband have two young sons and live in the suburbs and they're the most positive, neighborly guys you're ever going to meet. Today Tommy was telling me that because of their expanding family they moved to a new house in the same town. And who lives next door? Five Roman Catholic priests who teach at the local Catholic college. For the first few days it was a little awkward until the priests figured out what was up and that the nanny wasn't anyone's wife. But now they love the kids and are friends of the family. Hi Karl - I've known for years so reading that blog doesn't really suprise me. It's almost like it's written as Tommy's official coming out story, which is a bit suspicious, but nevertheless it was a good read. I was always drawn to Tommy's music when I was younger and I kinda knew he was gay anyways, but it's never my place to officially out someone - leave that to Perez Hilton I guess (who outed Jonathan Knight a few days ago). I had a very candid conversation with Tommy years ago in NYC which confirmed my questions about his sexuality, but who really cares anyways these days? Maybe some of his die hard Asian fans might be disappointed but Tommy's been out of the limelight for awhile now. As long as he's happy and it sounds like he is, then I'm more than happy for Tommy. I won't publish that blog on the homepage - it's not my place to do that and I respect Tommy too much to make a big deal out of it. If Tommy does however go back into the studio and make some good quality music, you'll bet that I'll be all over that! Tommy Page will always be one of my favourite musicians of all time and I'm glad to know that he too is just a normal person like you and me - standing up for what he is and what he believes in. Just who is this Karl who's been like going around posting the blog link on almost every website about Tommy? I love Tommy for his song writing abilities and his voice. I don't really care about his sexual orientation. So there!